Sharing Sites – does anyone want to share a post from their blog site? 6.2 Why are we even studying space, perspective, and higher dimensions? McMullen (2008) explains that if one variable, say w, depends on three independent variables, say x, y, and z, then these variables are forming a 4-dimensional relationships. He uses the example w (cost of gas), x (cost per gallon of fuel), y (miles driven), and z (fuel efficiency of a car). These can be plotted and analyzed mathematically, showing the relationship between these variables. Have you guys ever worked with more than three variables at a time? “Many of science, economics, etc., deal with such vector spaces [relationship between a set of variables]” (p. 37). In particular, vector algebra, linear algebra, and tensor algebra “involves N-dimensional relationships”. 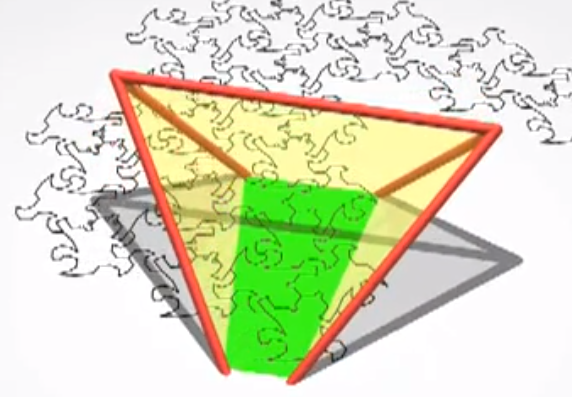 When one of these mathematical disciplines seeks to find the magnitude of a 4D vector, they are actually using a formula derived from a “4D generalization of the Pythagorean theorem” – do you guys remember the Pythagorean theorem? Group theory is another branch that benefits from the study of higher dimensions. Studying the ways groups of crystals and groups of elementary particles is similar to the way we can investigate groups of corners of higher-dimensional “polytopes”. SUPERSTRING THEORY!!! McMullen writes, “superstring theory actually predicts the existence of extra dimensions” (p. 37). In addition, “Over the past ten years there has been a sudden explosion of professional research on superstring-inspired extra dimensions in the field of particle physics. Superstring theory is perceived by most as the best candidate presently available for a theory of EVERYTHING”! Here’s one that I always believed was true – investigating higher dimensions helps us understand our own three-dimensional space better. In addition, we exercise our spatial visualization abilities and this can help us in virtually all aspects of our life. Lastly, at least from my point of view, it’s fun to contemplate something that doesn’t always end with a predetermined answer. Unlike most of math, higher-dimensional studies & investigating cases of space and perspective doesn’t leave us with a solution, but helps us see how complex space really is. I love “playing” with ideas that are too complex to give finality, but we should be willing to take it as far as we can, if nothing else, to exercise our minds and being aware of the limitations we carry (our blinders we wear in the world). You see this a lot with adults – they tend to REDUCE the world and purport their singular experiences of the world. It’s bigger than just space and perspective – it’s about being open to otherness. Last week I introduced the final project to you guys (see description). In case you are still wondering what you might want to create/explore/investigate, let’s look at some ideas that you guys have raised as a class to this point (combination of both classes). I made an Idea Map Poster for the wall and also have an Idea Map Handout for you guys. 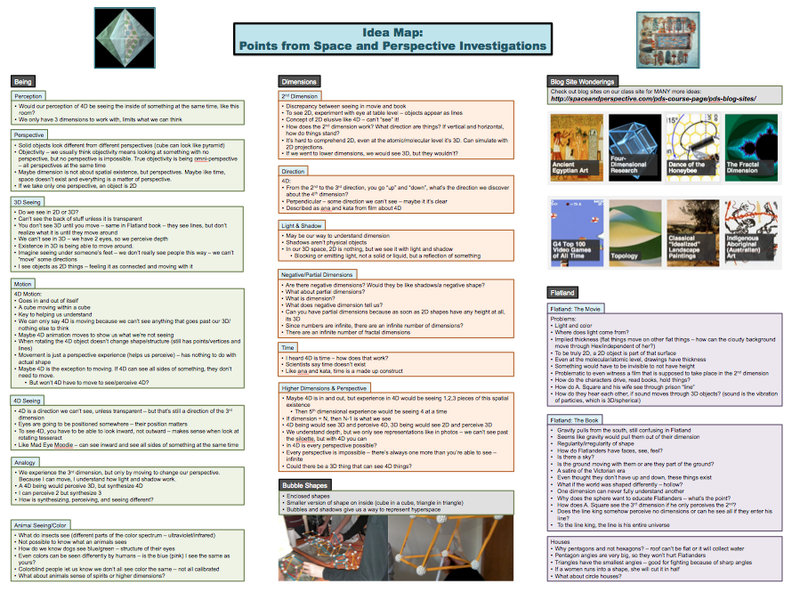 Using the handout, take some quite time (5-10 minutes) to really see what has emerged in class conversations about Space and Perspective. Make marks on the map and notes to yourself. Keep your project in mind as you do this. What ideas move you – that you want to understand more or even ones you feel you can help others understand. Also think about mathematization (remember our norms about mathematization). These ideas you guys have generated are full of questions, inquiry, problems to be worked out, etc. Let’s take some time to share project ideas with a small group to get feedback from each other. After a few minutes, we can talk as a whole class. If your group comes up with any questions about the project, make sure to jot these down. 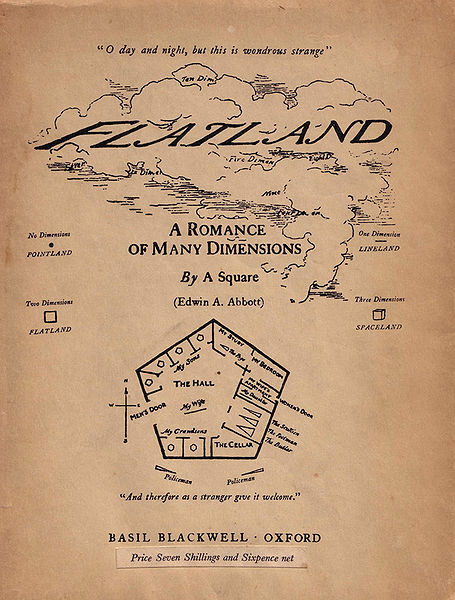 How was the book’s depiction of A. Square’s interaction with Lineland, Spaceland, and Pointland the same/different from the movie? What struck you about the second part of the book? There was a lot of mathematization taking place in this second part of Flatland (e.g., geometrical and arithmetical progressions, argument from analogy of figures). Let’s take a moment to extend these patterns from the book to even higher dimensions. First re-read the part from Section 19 before working with your group. Make sure to compare numbers of points (vertices), lines (edges), squares (faces), cubes (solids), tesseracts (extra-solids), etc. A. Square and Sphere both use analogy when talking to lower dimensions. Try to create your own analogy “map” from the point of view of a tesseract talking to a Spacelander. Consider including drawings (what do they look like) and properties of sound. Here’s a video I created (without numbers – on purpose) to show the motion between dimensions that both A. Square and Sphere describe multiple times. Feel free to use this as your group is mathematizing. We’ve been looking at problematizing space and perspective, even investigating the various ways space is captured and represented. But what about those spaces that are impossible or invisible? Let’s take a look at some examples representing these elusive spaces. 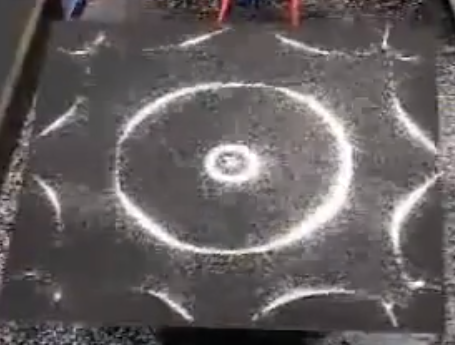 For this part, let’s look at one case example together, The Structure of Sound. As we look at this case, think about the idea of mathematizing this particular phenomenon. After investigating this case together, grab a partner and choose one of the letters below (A – H). Look at some of the cases and be prepared to share out with the class. Make sure you attempt to mathematize the case (this could be as simple as identifying patterns, raising questions for further investigation, making drawing/chart/etc.). Let’s plan to spend about 15 minutes exploring and then another 15 or so as a whole class. 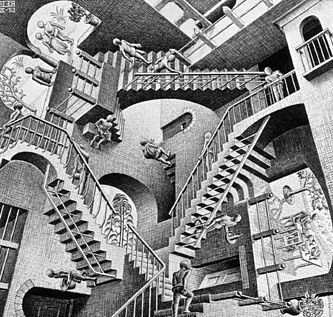 Optical illusions are images, art, sculpture – anything really – that seems different than reality. Below is a great example. 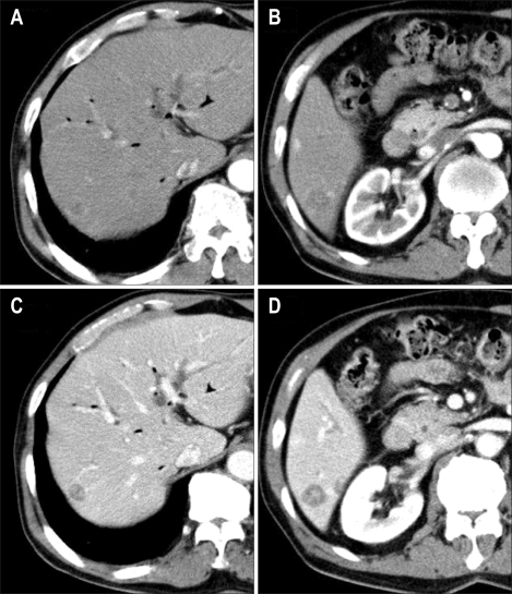 Notice the grey squares (A and B). Do they appear the same color in the first image? Check out the illustration showing that they are indeed the same color. Take a look at some various illusions like the one above. Sound is sometimes referred to as a wave and quite invisible. Yet, there are ways to capture visual representations of sound. The examples below illustrate some of these instances. In addition to the cases below, watch this experiment in a college class that helps show the difference in higher and lower frequency sounds. If someone is able to imagine something and create a blueprint or prototype, they in a sense give life to something that was once hidden. For this set of cases, look at some examples from Buckminster Fuller, graphic designers, artists, and even mathematicians. In particular, two cases (Fractals and Topology) show the mathematics of surfaces that might differ from the ones taught in textbooks. If you find yourself interested in varying surfaces (like a sphere with 2 holes) – you might like this chapter on mathematical surfaces – a great introduction to topology in mathematics. We’ve looked at games before, but they serve as an excellent case where imaginary worlds are created graphically. Take a second look at some of these games. 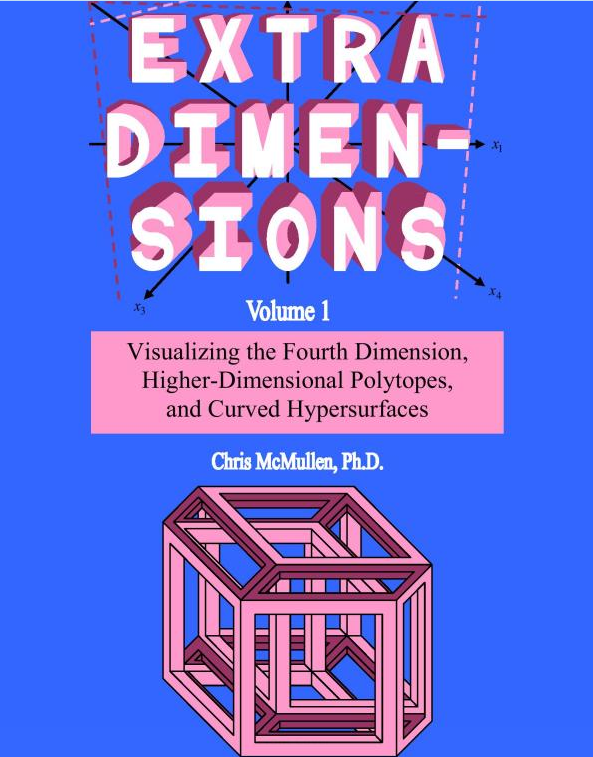 Chris McMullen’s Hypercube- and Hypersphere-Based Structures (book) – check out his drawings and description of chess, checkers, Rubik’s cube/tesseract in 4-dimensions. Topology chapter from Edmodo site about games on various surfaces. When I was an undergrad in 1993 – whew, that seems forever ago – I didn’t want to take biology for fear of having to dissect animals. Instead, I elected to take botany (where I found dissecting plants just as disturbing). The professor showed the entire series of The Private Life of Plants and this was the first time I remember being able to see INSIDE a plant. Some of these cases below represent these micro or hidden spaces that we can’t see with our own two eyes, yet they exist. Take a look. I’ve stated elsewhere that marrying my husband meant joining him in cheering on Nicky Hayden and Valentino Rossi (from the Moto GP). As I’ve watched the videography of these races over the years, new cameras (e.g., the Gyrocam) have been increasingly used to capture the riders as they race along international circuits. Let’s take a look at some cases that can help us think about capturing spaces that were once out of our realm. We know intuitively that objects look different in darkness than in light. But what about objects that constantly change? How do we capture their transitory nature? Let’s take a look at the Storm King exhibit to see how these objects are created and captured. Since Storm King is just across the Hudson, it would be great if you could talk your parents into taking you. Many of these exhibits are permanent installations. If you do have a chance to go, please take video and photos to share with us. I may have stated this elsewhere, but as a high school student, I would spend countless Friday evenings in bookstores. What a date! I would always gravitate to two sections – architecture and Picasso books. 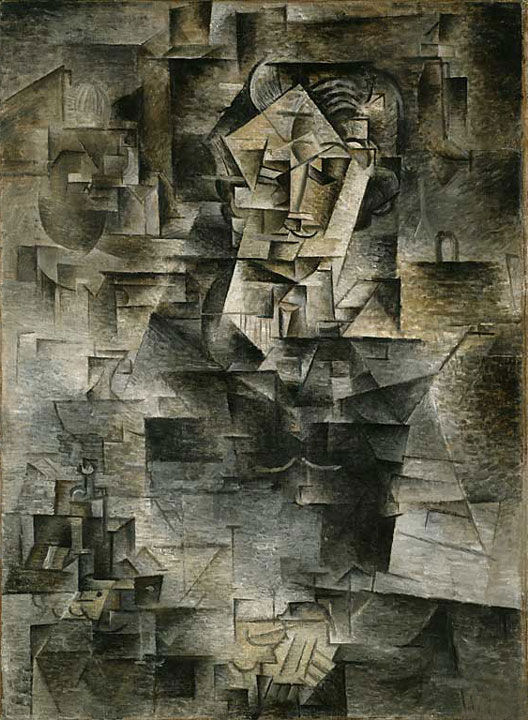 I loved Picasso’s odd-looking paintings and discovered later that there were other artists in the same vein – called Cubist painters. Let’s take a look at some of these works of art (from cubism and more modern pieces). 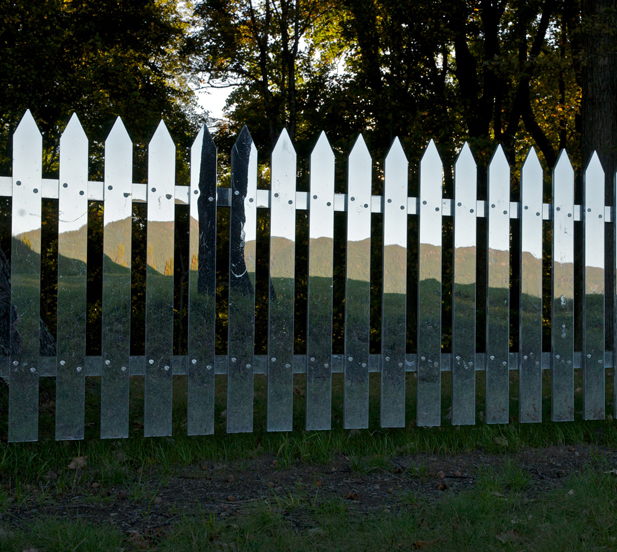 How are these works of art capturing “invisible” or imaginary spaces? Be ready to continue working on your final project Friday (May 10). Bring any materials, ideas, questions, etc. with you. If you are planning to work with a partner or group, talk with them before Friday, especially if they are in another class section. Presentation of your projects will occur during the last week of May. After viewing a series of optical illusions, describe what you see first, next, and then see if there is something else. Find or create an optical illusion for your classmates and post the image on your blog. Ask each other to comment on what you see first, next, etc. After viewing sound waves of music, talking, nature, etc. – write about the difference in perspective of hearing and seeing sound. 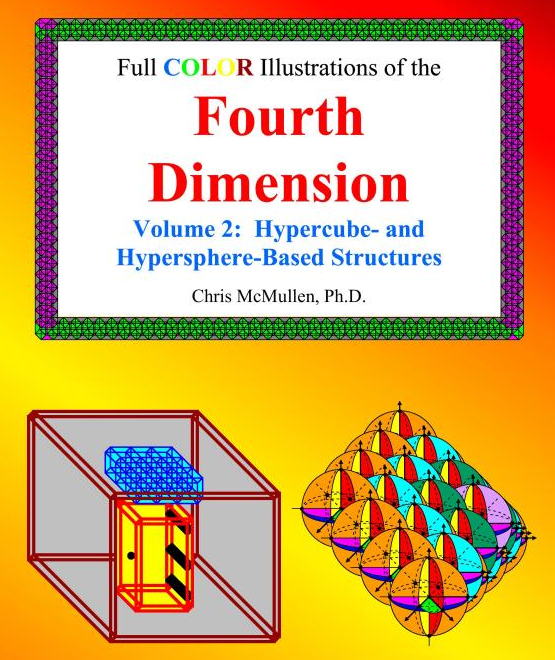 Games: Check out the book I left in class for you guys, McMullen’s Hypercube- and Hypersphere-Based Structures. He includes illustrations for common games in the fourth dimensions (chess, checkers, the Rubik’s cube/tesseract, etc.). Write about what this might be like to play a game in 4 dimensions – how would your strategy change? Choose any one of the cases above (A-H) and write freely on some aspect you find interesting.